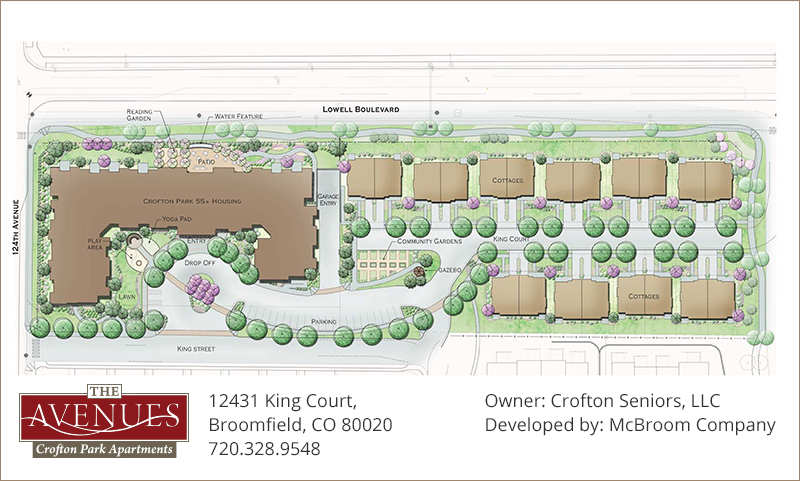 The Avenues Crofton Park retirement community in Broomfield, Colorado is designed with your comfort in mind. From our spacious and comfortable floor plans to our luxurious amenities, we provide a relaxing, enjoyable atmosphere for all of our residents. Our 55+ community includes a three-story apartment complex and neighboring cottages, with our community gardens and walking path connecting the two. See what our award-winning 55+ community has to offer. Exit 120th Ave. and head west for 2.4 miles. Turn right (north) on Lowell Blvd. Turn right (east) at 124th Ave.
Drive one block to King Street and turn left. Go east 3.3 miles and turn left on Lowell Blvd. Right on 124th Ave., and left on King St.
Our building is on the left at 12431 King Court, Broomfield, CO 80020.